Just another quick update on EAT MY GLOBE as it is going to be a little more quiet over here on DOS HERMANOS as I head off around the world for the next few months. HP will obviously be keeping his, er, end up and I shall be posting about the restaurants I visit as I travel, but I suspect in the wilds of China or bumping along on the Trans Siberian Express, they may be few and far between. Once the Japan, Hong Kong, China, Mongolia, Russia, Finland part of the trip is over, I shall be off around the USA, Mexico, Argentina and Brazil, so I suspect there will be more restaurants to write about on that part of the trip. 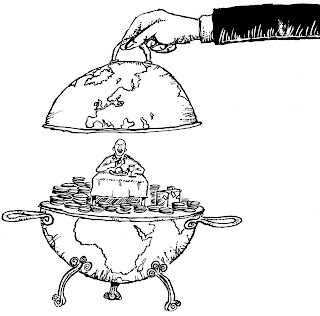 If anyone is wondering about the cartoon, it is the work ( and copyright) of a hugely talented illustrator called James Burgess and was commissioned by John Murray, the good folk who will publish the EAT MY GLOBE book in 2009. Have a great time- looking forward to reading all about your gastro-adventures! !